Justin The Artistic Horse and I would like to thank everyone for your support in 2013. This was our first year painting at public events. I didn’t know what to expect of Justin painting in new locations but he handled it like a pro. He is one of the few artists who demonstrates his technique in unfamiliar locations instead of his cozy studio in his barn. By doing this we have met many people of all ages who smiles are priceless while they watched him paint. The love of humans is a trait of the Friesian breed and Justin certainly possesses it. In addition to his painting talent he enjoys making people laugh by doing his crazy antics during the demo and talking to the crowd, non-verbal of course. In spite of all the diversions his paintings are masterful upon completion. The paintings display the powerful equine energy of such a magnificent soul. The bright colors we choose to use during a demonstration reflect the positive energy projected from the audience. 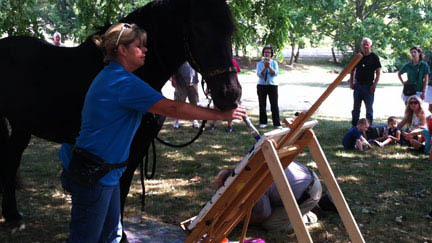 Keep in mind that horses energy is free spirited, wild, and independent you can see and feel the horse in each painting. 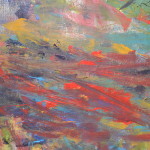 Justin has refined his energy and applied it to each painting. We look forward to meeting many more of you in 2014, The Year Of The Horse… Justin The Artistic Horse that is.